How do you make this chicken with just a few ingredients? How do you get fried-style deliciousness from an oven-baked dish? All will be revealed…. Pour dressing over chicken in shallow dish; turn to evenly coat both sides of each piece. Refrigerate 1 hour to marinate. Heat oven to 400ºF. Combine coating mix and cheese in pie plate. Remove chicken from marinade; discard marinade. Add chicken, 1 piece at a time, to coating mixture, turning to evenly coat each piece. Place on foil-covered baking sheet. Bake 38 to 40 min. or until done (165ºF). Serve with one of these delicious side dishes: Ranch Mashed Potatoes, Fresh Green Beans and Basil. 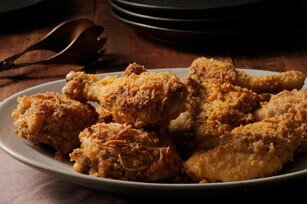 Prepare using bone-in chicken pieces, such as drumsticks or breasts. To easily marinate chicken or beef, freeze it right in the marinade. Just place the poultry or meat pieces in a resealable freezer-weight plastic bag. Add enough marinade to evenly coat the meat, then seal the bag and freeze up to 3 months. Remove from the freezer the day before cooking and place in the refrigerator to thaw. The meat will marinate in the dressing as it thaws.